Guards and screens are the most important fireplace accessories and, consequently, a tremendous amount of design work is involved. During our many years of manufacture, innovative improvements have enhanced product safety and quality. For DeCaro, safety stands above all other requirements, thus making the design and materials used of paramount importance. 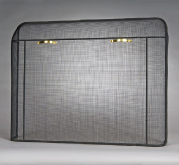 Depending upon the model of the screen/guard, the mesh metal curtain comes in either a stiff or flexible style. 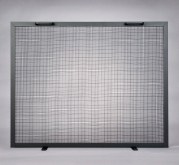 The framing is designed in such a way that the metal curtain can be operated with ease, and includes mounting provisions to fit varying openings. As with all of our products, a range of materials and finishes are available. 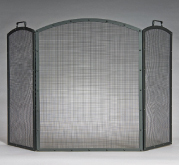 In addition, standard as well as custom screens/guards can be specially manufactured upon your request. 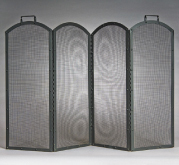 Centre Panel: 24" x 30"; Side Panel: 12" x 30"
Each Panel: 12" x 30"